Cool cookies completely before storing: cookies that are packed warm can become mushy from condensation and lose their crisp or cakey texture. Cut pieces of wax paper to fit cookie tins to keep the layered cookies from sticking together: you can do this a week ahead and store the wax paper inside the tins. Once the tins are filled up, seal the edges of the tins with scotchtape to help keep the air out. Storing cookies in shallow tins prevents them from breaking: be sure to put layers of wax paper between each layer of cookies. For cream filled cookies, store the filling separate, and finish the cookies the morning before you plan to serve them. Check out my latest post on AOL on how to make Poppy Seed Rolls from scratch! Want to learn more about old-fashioned baking? Listen to this episode, she talks about the wide variety of christmas cookies she used to make each year and how she shared holiday cheer in the form of cookies with all her friends and neighbors. 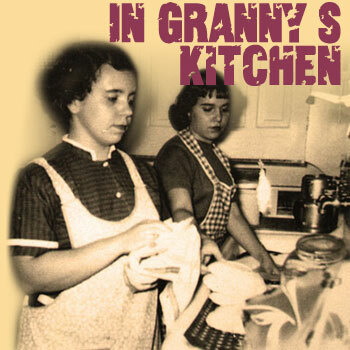 In Granny’s Kitchen is a series of taped conversations that take place at Granny’s kitchen table, in the house where I grew up. Listen to our kitchen talk focused on family traditions, rituals, and how the quality of food has changed since Granny was a girl growing up in the Depression era. Learn what Granny did to keep the close connection to her family, friends, and neighbors and how her traditional views on food shaped my own philosophy on health and well-being. Click here for an overview of available episodes. Jen, loved the interview with Granny. Loved hearing those stories of the past. Please send our love to her. I can't wait to try the Poppy seed roll. Lots of love to you and your whole family. And of course thanks for all the good information during the year. Thanks for writing in!!! I thought you might enjoy this and I KNOW how much you love my nutroll/poppyseed roll. I will miss your tricolor cookies this xmas… hugs! Here is a tip, find the Solo Poppy filling in the Jewish section in your market. They also have almond and date. THey carry more around the holidays but try to buy them early because at my market they sell out fast. Great tip! Also if you don’t have a Jewish section in your market you can also order it online in a pinch..